Not much going on here of interest. Lots of working, lots of Matt and I passing Cadie off to each other. We are heading to the beach house at the end of next week, and REALLY looking forward to it. I know we just went on vacation at the beginning of June, but I think we can really use this trip too. I love that little face. 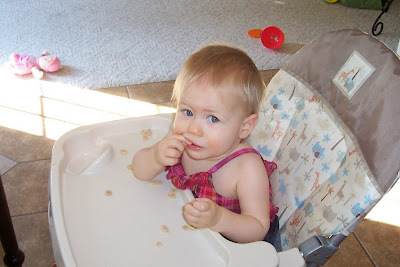 She loves her cheerios!! She is so cute. I miss seeing her do this in person. I'll be sure to have lots of cheerios in August! What a wonderful picture of our little cutie pie! We are praying for all of you. Have a great time at the beach house. Take lots of pictures! I'm married to my best friend, mama to 2 gorgeous little girls, and a follower of Jesus Christ. I'm a school librarian and a morning coffee enthusiast. We live in Northeast GA, in the middle of beautiful nowhere. Matt's album - Buy it today!